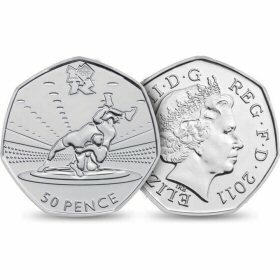 There are 29 Olympic 50p designs. They were produced in 2011 to mark the London 2012 Olympics. 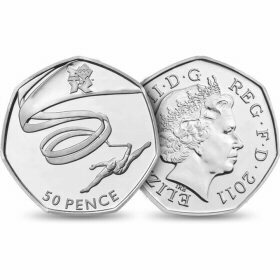 As 29 new 50 pence coins entered circulation in a single year, the mintage figures for each coin were quite low in comparison to most other non-Olympic 50p's. 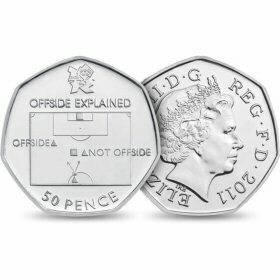 The 2011 London 2012 Olympic Football design is very rare, around 1 in 1883 50 pence coins have this design. 1,125,500 coins dated 2011 entered circulation. 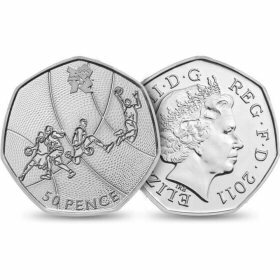 The 2011 London 2012 Olympic Wrestling design is very rare, around 1 in 1876 50 pence coins have this design. 1,129,500 coins dated 2011 entered circulation. 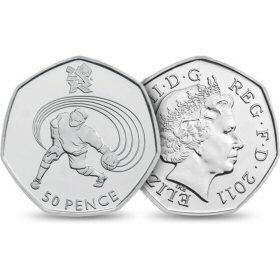 The 2011 London 2012 Olympic Judo design is very rare, around 1 in 1824 50 pence coins have this design. 1,161,500 coins dated 2011 entered circulation. 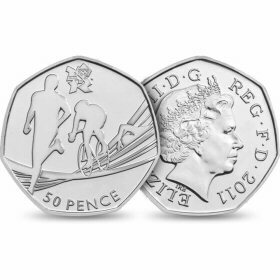 The 2011 London 2012 Olympic Triathlon design is very rare, around 1 in 1821 50 pence coins have this design. 1,163,500 coins dated 2011 entered circulation. 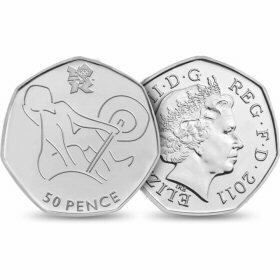 The 2011 London 2012 Olympic Tennis design is rare, around 1 in 1457 50 pence coins have this design. 1,454,000 coins dated 2011 entered circulation. The 2011 London 2012 Olympic Goalball design is rare, around 1 in 1312 50 pence coins have this design. 1,615,500 coins dated 2011 entered circulation. 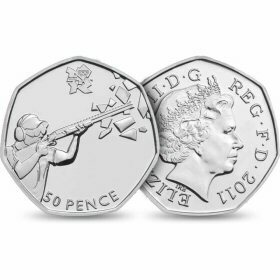 The 2011 London 2012 Olympic Shooting design is rare, around 1 in 1279 50 pence coins have this design. 1,656,500 coins dated 2011 entered circulation. 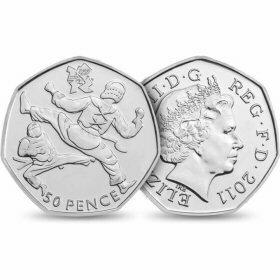 The 2011 London 2012 Olympic Taekwondo design is rare, around 1 in 1273 50 pence coins have this design. 1,664,000 coins dated 2011 entered circulation. 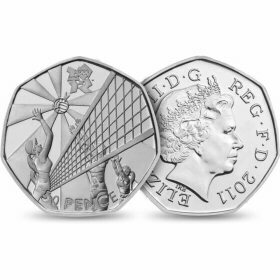 The 2011 London 2012 Olympic Handball design is rare, around 1 in 1264 50 pence coins have this design. 1,676,500 coins dated 2011 entered circulation. The 2011 London 2012 Olympic Modern Pentathlon design is rare, around 1 in 1254 50 pence coins have this design. 1,689,500 coins dated 2011 entered circulation. 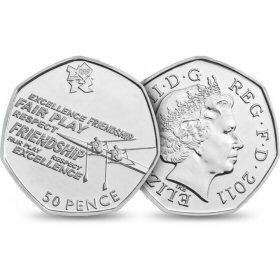 The 2011 London 2012 Olympic Rowing design is rare, around 1 in 1234 50 pence coins have this design. 1,717,300 coins dated 2011 entered circulation. 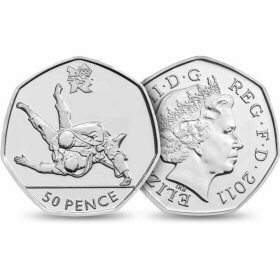 The 2011 London 2012 Olympic Gymnastics design is rare, around 1 in 1231 50 pence coins have this design. 1,720,813 coins dated 2011 entered circulation. 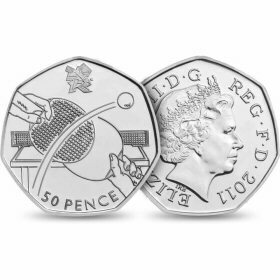 The 2011 London 2012 Olympic Table Tennis design is rare, around 1 in 1220 50 pence coins have this design. 1,737,500 coins dated 2011 entered circulation. 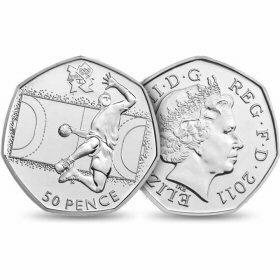 The 2011 London 2012 Olympic Basketball design is rare, around 1 in 1212 50 pence coins have this design. 1,748,000 coins dated 2011 entered circulation. 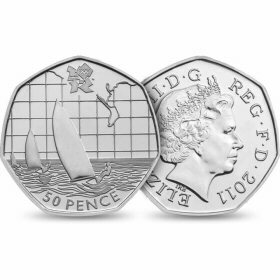 The 2011 London 2012 Olympic Sailing design is rare, around 1 in 1211 50 pence coins have this design. 1,749,500 coins dated 2011 entered circulation. 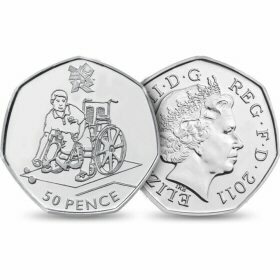 The 2011 London 2012 Olympic Wheelchair Rugby design is rare, around 1 in 1200 50 pence coins have this design. 1,765,500 coins dated 2011 entered circulation. 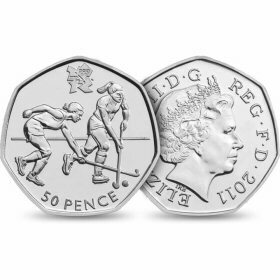 The 2011 London 2012 Olympic Hockey design is rare, around 1 in 1195 50 pence coins have this design. 1,773,500 coins dated 2011 entered circulation. 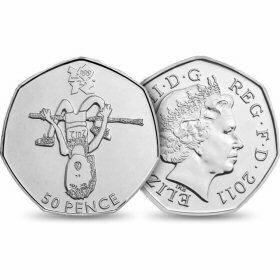 The 2011 London 2012 Olympic Weightlifting design is rare, around 1 in 1127 50 pence coins have this design. 1,879,500 coins dated 2011 entered circulation. 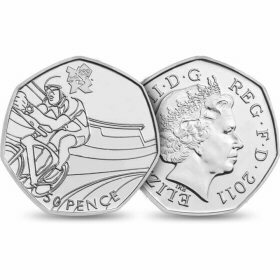 The 2011 London 2012 Olympic Cycling design is rare, around 1 in 1014 50 pence coins have this design. 2,090,500 coins dated 2011 entered circulation. 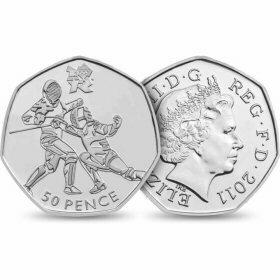 The 2011 London 2012 Olympic Fencing design is rare, around 1 in 1002 50 pence coins have this design. 2,115,500 coins dated 2011 entered circulation. 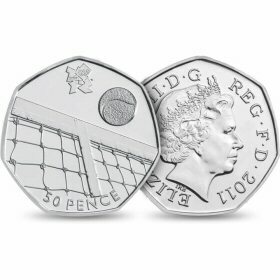 The 2011 London 2012 Olympic Volleyball design is very uncommon, around 1 in 993 50 pence coins have this design. 2,133,500 coins dated 2011 entered circulation. 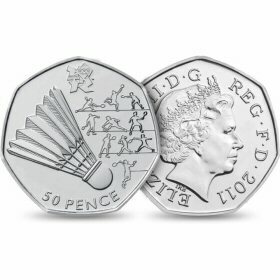 The 2011 London 2012 Olympic Badminton design is very uncommon, around 1 in 993 50 pence coins have this design. 2,133,500 coins dated 2011 entered circulation. 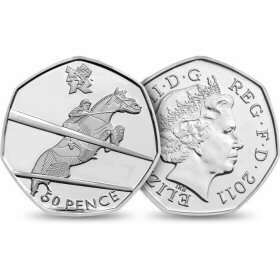 The 2011 London 2012 Olympic Equestrian design is very uncommon, around 1 in 989 50 pence coins have this design. 2,142,500 coins dated 2011 entered circulation. 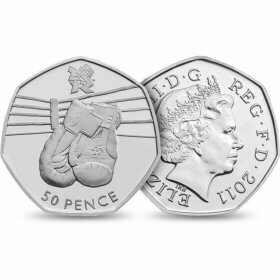 The 2011 London 2012 Olympic Boxing design is very uncommon, around 1 in 986 50 pence coins have this design. 2,148,500 coins dated 2011 entered circulation. 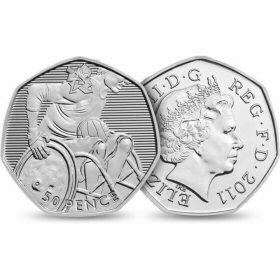 The 2011 London 2012 Olympic Boccia design is very uncommon, around 1 in 978 50 pence coins have this design. 2,166,000 coins dated 2011 entered circulation. 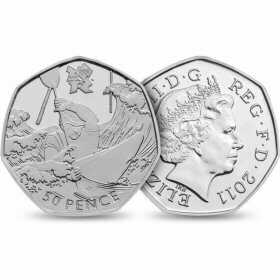 The 2011 London 2012 Olympic Canoeing design is very uncommon, around 1 in 978 50 pence coins have this design. 2,166,500 coins dated 2011 entered circulation. 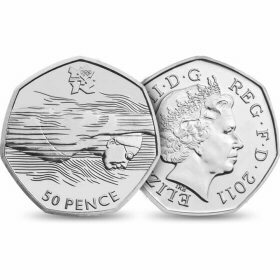 The 2011 London 2012 Olympic Aquatics design is very uncommon, around 1 in 972 50 pence coins have this design. 2,179,000 coins dated 2011 entered circulation. 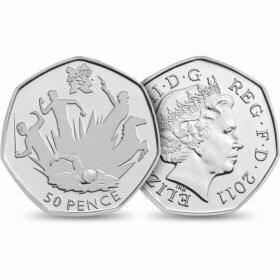 The London 2012 Olympic Athletics design is very uncommon, around 1 in 953 50 pence coins have this design. 2,224,000 coins dated 2009, 2011 entered circulation. 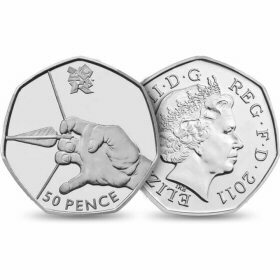 The 2011 London 2012 Olympic Archery design is very uncommon, around 1 in 633 50 pence coins have this design. 3,345,500 coins dated 2011 entered circulation. Comparative Rarity Score is a measure of coins availability in comparison to other 50p coin designs. High scores in themselves do not mean there is a small number of a coin in existence, just that the coins do not come up in general circulation very often. The number of coins that enter circulation is shown where available. In order to generate rarity scores / listing positions, we make some assumptions in relation to coins in existance, but no longer in general circulation. This is based on the number of years the coin has been in circulation and on a sample of 5000 50p coins.